Bimsports Casino has been closed. Don't be too upset - it probably wasn't that good anyway. Luckily, we can help you choose one that doesn't! Bimsports Casino is a tiny part of a monstrous gambling platform with several products available. This “tiny part” beats the crap out of most online casinos that we know. Seriously, 1,000+ games from 19 developers, a convenient lobby, a good welcome offer with fair wagering requirements, almost no ridiculous bonus terms, numerous banking options, live games, mobile app - this place is great. The Welcome Bonus for casino players is a 100% match, up to €300, with the wagering requirements of 35 times the bonus value. The catch is that you can’t wager it on all of the games, but only on games from NetEnt, Microgaming, Amaya, and a few other providers. Rare and exclusive games like backgammon. Pretty long payouts (with a 72-hours pending period). We’ll probably start by saying that Bimsports Casino is HUGE. These guys seem to have covered as much as possible on a single website - casino, sportsbook, poker, skill games, virtual betting, pool betting, live casino. Holy Moly! They are licensed by the Government of Curacao, as well as all other gaming venues of Radon B.V. which isn’t too exciting but will do. With so many products, it would have been easy to make a mess from the website. Luckily, they didn’t. The casino section throws you right into the lobby with numerous game categories, software filters, 11 language options (English, Russian, Spanish, French, German, etc.). It looks clean and is easy to navigate through - what else do you need? Banking: The banking options are diverse - besides the usual Skrill, Neteller, and credit cards, you also get some local (and mostly Russian) payment methods - Giropay, ecoPayz, iDeal, Yandex Money, and more. The withdrawal time takes up to 72 hours for e-wallets and even more for other types of payments. The payout limits depend on a withdrawal option you choose. Customer Support: The support service is available daily around-the-clock through email and live chat. However, the live chat becomes available only after you open an account here. We’d like to see a toll-free phone number here, but that’s probably too much to ask for. And if you think that this is a bad support service - you haven’t seen what Casino On Net offers. With over 1,000 games from 19 software providers, it’s nothing short of freaking awesome! Most of the developers are smaller studios - Mr Slotty, Join Games, Habanero - but there are also popular ones like NetEnt, Playson, ELK, NextGen, and more. If we told you that Bimsports Casino has a nice game library, it would have been a severe understatement. Skill Games: Backgammon, Chinese Poker, Belote. 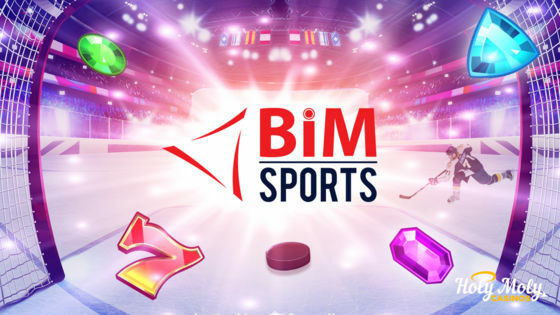 Not only does Bimsports Casino work just fine right in your mobile browser, but it also has an app for Android devices that you can download from their website. In the Live Casino section, you have a choice between three platforms: BetConstruct, Evolution, and Ezugi. In the Live Casino section, you have a choice between three platforms: BetConstruct, Evolution, and Ezugi. Each platform has all live dealer games you might expect (Roulette, Blackjack, Baccarat, Casino Poker, Casino Hold’em) and even some games you might NOT expect (Bet On Numbers, Keno, Dragon Tiger). The welcome bonus at Bimsports Casino is pretty simple - a straightforward 100% match bonus on the first deposit, up to €300. The wagering requirements are alright - 35 times the bonus amount - and you have 14 days to complete them. The only catch here is that not all the games are allowed to be played with the bonus. You can use the bonus only on the games from NetEnt, Microgaming, Playson, Amaya, and several other providers. Also, you can get a 75% match bonus, up to €300 on your second deposit. Thankfully, all the requirements remain the same without being increased as in many other casinos. Anyway, read the bonus terms carefully before claiming any bonus. Bimsports Casino is cool. The games collection is fantastic, the welcome bonus is nice, and the website is convenient. If you get tired of classic casino games, you can try out something different like Backgammon or Chinese Poker. Or even a sports bet or two, who knows. Their support service is not that perfect, and the withdrawal time is pretty long, but everything else seems fine, so we think that this casino is worth checking out. If you don’t like this one for whatever reason - check out Bet-at-home Casno or Rizk Casino. There are lots of bonuses and other goodies to impress you. Click here to play at Bimsport casino - truly a jack-of-all-trades!